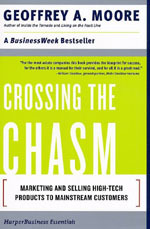 I just recently finished reading Geoffrey A. Moore's Crossing the Chasm, and found myself drawing parallels to the sharing economy and collaborative consumption throughout the entire book. Though it was originally written in 1991 (revised 1999) and focuses mainly on high technology products, it holds so many valuable lessons that I'm devoting a few blog posts to discussing it. The book starts with the "Technology Adoption Life Cycle", which is an excellent way of framing any market. It's designed to trace how a new technological innovation enters the market and gains widespread adoption. It was originally developed at Iowa State University to track the purchase of hybrid seed corn, and in the book is used to follow new software, PDAs, and some "hard tech" products, but it holds true for sharing as well. Even though the sharing economy isn't a strict technological innovation, the new products, services, and ideas it is responsible for follow the same curve of adoption. Though it is enabled by new technologies (Leah Busque and Lisa Gansky discuss solomo here and here ), the heart of the sharing economy is really about an idea: sharing stuff instead of buying it. As you can see from the curve, there are 5 categories in the life cycle - innovators, early adopters, the early majority, the late majority, and of course laggards. 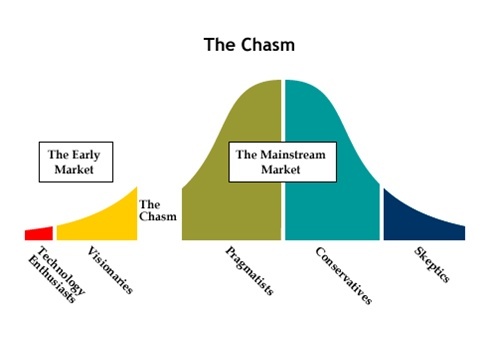 The book focuses on helping companies cross the chasm between early adopters and the early majority, but I think it's first important to talk about the characteristics of each group. The innovators (besides the creators of technology themselves) are the consumers most drawn to new products. In the sharing economy, these are people who are already carpooling, bartering, and efficiently using their resources. They actively look for new ways to share, and have jumped at the chance to Couchsurf, TaskRabbit (it's a verb now), or Getaround. Next are the early adopters. They're open to try new technology (or in this case ideas), and easily understand the benefits - "Renting a room on Airbnb instead of a hotel saves me money. Cool!" The vast majority of existing sharing services only have members from these first two groups. Next, across the chasm, are the early majority. They're also known as pragmatists, which starts to explain why it's difficult for companies to attract them. They are open to new technology, but wish to see a solid reference base. Especially for a large behavior change (renting out a car that normally is always in your driveway, for example), the early majority wants to know that the model works. Once the early adopters are on board, the late adopters want to see the technology (or idea) as a standard before committing. They're another very large segment, but only adopt a new technology after it's been proven consistently. Last are the laggards - they're not worth devoting much time to, simply because they very rarely actually adopt a new technology. Phew - now that the market part is out of the way, I can spend some time in future posts talking about companies on both sides of this chasm, and what lessons there are to be learned. I'd love to hear your thoughts if anyone else has read the book, or anything you'd like to see in the future.